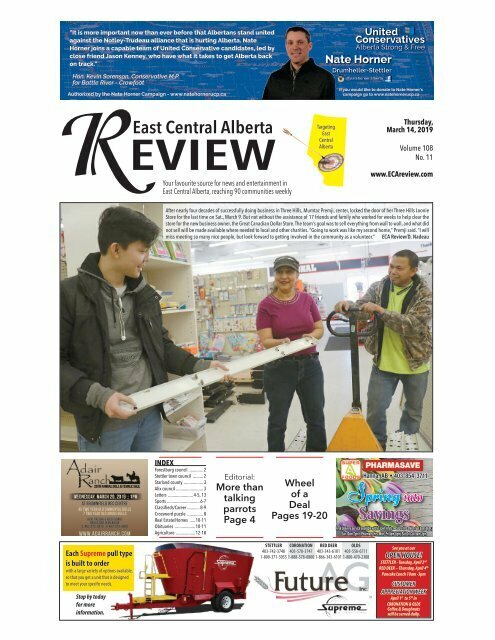 East Central Alberta REVIEW Your favourite source for news and entertainment in East Central Alberta, reaching 90 communities weekly Targeting East Central Alberta Thursday, March 14, 2019 Volume 108 No. 11 www.ECAreview.com After nearly four decades of successfully doing business in Three Hills, Mumtaz Premji, center, locked the door of her Three Hills Loonie Store for the last time on Sat., March 9. But not without the assistance of 17 friends and family who worked for weeks to help clear the store for the new business owner, the Great Canadian Dollar Store. The team’s goal was to sell everything from wall to wall, and what did not sell will be made available where needed to local and other charities. “Going to work was like my second home,” Premji said.  “I will miss meeting so many nice people, but look forward to getting involved in the community as a volunteer.” ECA Review/D. Nadeau at Brownfield Rec Centre 45 Two Year Old simmental Bulls 7 Two Year Old Angus Bulls KEN, TREENA & HEIDI ADAIR BRUCE AND JEAN ADAIR C: 403-575-5470 H: 403-578-4468 WWW.ADAIRRANCH.COM INDEX Forestburg council ............. 2 Stettler town council ......... 2 Starland county ................. 3 Alix council ........................ 3 Letters ...................... 4-5, 13 Sports .............................6-7 Classifieds/Career ...........8-9 Crossword puzzle .............. 8 Real Estate/Homes .....10-11 Obituaries ..................10-11 Agriculture .................12-18 Editorial: More than talking parrots Page 4 Wheel of a Deal Pages 19-20 Hanna, AB • 403-854-3711 Spring into Savings Free delivery service available within town limits tore rs onat amm n amm harmacy rs on Fri amm at n all amm Each Supreme pull type is built to order with a large variety of options available, • Front Center Door With 10’ Flat Conveyor • (4) 11R/22.5 16 Ply Truck Tires with Budd Wheels and HD so that you get a unit that is designed to meet your specific needs. • (2) Patented Freestanding Vertical Mixing Augers Stop by today for more information. Discharge Ground Clearance STETTLER 403-742-3740 1-800-371-3055 CORONATION 403-578-3747 1-888-578-0800 RED DEER 403-343-6101 1-866-343-6101 OLDS 403-556-6711 1-800-470-2388 See you at our OPEN HOUSE! STETTLER - Tuesday, April 2 nd RED DEER – Thursday, April 4 th Pancake Lunch 10am -3pm CUSTOMER APPRECIATION WEEK April 1 st to 5 th in CORONATION & OLDS Coffee & Doughnuts will be served daily.